This isn't the first time I've posted a wine gelée. I'm crazy about them. I had an old Jamie Oliver recipe for an Elderflower/Prosecco gelée sitting on my desktop for ages and then while recently reading through Deborah Madison's dessert book, lo and behold there was a gelée and fruit recipe. I loved the way she presented it.... such a light and summery looking dessert. But I also preferred Jamie's idea of using elderflower liqueur (mainly because I have a lovely bottle of St~Germain) and Prosecco so I combined the two recipes. Whether that makes this my invention I have no idea, so consider them both credited for this recipe. Let's talk a bit about elderflower liqueur. I splurged on a bottle originally because it was an ingredient in a very special mixed drink I was making for a luncheon. I've since been won over: try an Elderflower Martini; and Elderflower liqueur is lovely to sip by itself, but with a splash of champagne or club soda, yum. It's also wonderful poured over sorbet or vanilla ice cream. So many drinks, so little time. LOL. There's an interesting story behind this particular liqueur. Please note that most of this information and the quaint photos are from the St~Germain website. St~Germain is the first liqueur in the world created in the artisanal French manner from freshly handpicked elderflower blossoms. These fragile flowers begin to lose their delicate fragrance and flavor very quickly. When the delicate, white elderflower blossoms are at their peak, men gather sacks of them from the foothills of the Alps. There is only a 2 to 3 week window of blossoming. French farmers are organized to deliver sacks of the elderflower blossoms to local depots, some using specially rigged bicycles. The flowers are sent to the distillery quickly and macerated—steeped in alcohol to absorb almost all of the aroma, flavor and color—in order to maximize freshness and flavor. The manufacturing process is secret, but involves eau de vie, distillation and the addition of citrus and cane sugar. Take a whiff and a lychee aroma hits you right away. Then there’s a bit of peach, some orange that evolves to grapefruit, and maybe some pear. Really, sheer heaven. With this recipe, you'll find elderflower liqueur makes the wine gelée very special. I've made port wine gelées, white wine gelées, but until I came across Jamie's recipe, I had never thought of an elderflower and Prosecco combition. The Prosecco bubbles actually stay in the gelée and fizzes a bit in your mouth when you eat it. But what sold me on combining this with Deborah's idea was her cubing of the gelée. Brilliant idea. Larger molds are always pretty, but the fruit is forever popping to the top, unless you are extra cautious about not adding them until the gelée is nearly set. And then you have to worry about unmolding. An unmolded wine gelée has to be perfect. This is not rocket science, but Deborah's method is so much easier. And a tad more casual. I sprayed a 9" square pan with Pam and then poured in the gelée mixture, covered and refrigerated it overnight. The next day, I took a sharp knife, cut around the pan and then cut the gelée in small cubes. I used a spatula to release them. You can use whatever fruits you like and as many as you like. And I liked the increased amount of sugar in Deborah's recipe...don't worry, it's still not that sweet. In fact, I really prefer a dollop of sweetened whipped cream on top of mine. Sprinkle the gelatin over 1/4 cup cold water to soften. Heat the liqueur and sugar until the sugar dissolves. Add the softened gelatin mixture and stir until dissolved. Remove from heat for a minute or so and then add the Prosecco. Immediately pour into a 9" square pan, cover and refrigerate overnight. The next day, use a knife to cut the gelée into squares and layer with fruits of your choice. Serve cold. Garnish with mint or a dollop of whipped cream. Here in England a lot of people make elderflower cordial. The elderflower is commonly found all over the place here. Knowing me though, I'd probably pick something that "looks" like elderflower and poison myself, LOL... so i tend to stay away. Elderberries I've heard of, never the flower! Oooh. St Germain is definitely yummy. I like the look of this gelee! You had me at Prosecco, Barbara, you had me at Prosecco! I've never had gelee before. Or elderflower liqueur. But after reading this post...and seeing those pictures....I definitely need to try both of them! Awesome dessert. Barbara these are absolutely lovely! That looks and sounds most delicious! Snap Kristin- the pictures really are wonderful Barbara. I was at a party this weekend where someone knew the guy that started St Germain... that's a guy I'd love to meet. Love the recipe... I can't wait to have bubbles in gelatin... how cool is that? Great recipe, Barbara and I loved learning more about St Germain. Now what is that very special mixed drink???? This is an absolutely fun dessert to serve. It's different, it's light and certainly an eye-catcher! This looks beautiful. I think elderflower is often used for medicinal purposes, namely to help insomnia. I've had elderflower tea a few times and it was very good. I love all the fresh fruit in this dessert. Your gelee looks very elegant. I make elderflower cordial every year but have never tried the liqueur - it sounds wonderful. Your gelee looks so beautiful! Great idea to combine the best of the two recipes, it looks fabulous! I must admit that I was skeptical but I kept reading. I was very intrigued by the elderflower wine. The flowers are quite lovely so the drink must be delicious. Oh my, when I got to the actual visual of the gelee and read the recipe I really want to make it. Now I'm wondering where I will find the elderflower liqueur. In the meantime, I'm bookmaking the recipe. It looks like the perfect summer luncheon dessert. This is so elegant! The elderflower liqueur sounds so fragrent and lovely. I'd love to find it and make this. That why I'm saying Human Being is genius! I bet those flowers smell amazing. Just imagine the flavour of those drinks! hmm..mm..yumm.... Hope you're having a wonderful day! This would be so perfect for a warm summer afternoon. Now I have to shop for elderflower liqueur! This looks delicious. What a beautiful dessert. This looks so delicious! Beautiful pictures. This looks so beautiful and refreshing, Barbara - I have never made or tasted a gelee - will have to remedy this! What a beautiful and fabulous dessert. I've never had St. Germain, but I imagine it to be delicate and fragrant. Gorgeous looking gelee Barbara. I can image the taste is delicious as well. Elderflower liquer? And to make it into gelee! I love the way your mind works! Don't they look elegant! Love this post. I am now off to the liquor store to buy Elderflower Liquor. What else is in your Elderflower Martini, Barbara? The gelee is beautiful, a work of art. Thanks for sharing, it look refreshing! Beautiful! I'd like to find some elderflower liqueur soon to try! My goodness, what a beautiful dessert for summertime! I've never tried Elderflower liqueur but, after your wonderful description of it, I must! PS: your cherry clafoutis..? J'adore !!! I love rice krispie squares too. I've been wanting to make them forever but know I need someone to share them with, or I'll eat the whole batch. (Ben's on a diet and is absolutely no help.) Luckily, I'm meeting up with a girlfriend in Austin next weekend so I'll be able to make some! Oh my Gosh, Barbara, this is so beautiful. I love the fruit suspended the the gelee. This is a truly elegant dish-I'm saving it to my recipe files. Ooh, and I want a bottle of St. Germain elderflower liqueur! i love that everytime i get one your blog i learn something new! these look just delicious and so fun adn unique! We Italians do enjoy our Prosecco very much. I've seen it used in a few ways. However, this is very different indeed. I'm not quite a fan of gelatin...however , my sis-in-law would love this recipe. I'm passing it along. I am learning something tonight! These flowers are so pretty and fragile looking; the liqueur must be a delight and so is this dessert. Light elegant and smashing! Such a beautiful and refreshing dessert! I am a fan of elderflower liqueur, and have been known to enjoy an elderflower cocktail now and then, too :) Must be wonderful in the gelee. Elder tree is an invasive tree over here, and farmers hate it. Last year I made elderberry jam, but wasn't happy with it, this year I made elderberry syrup, which we dilute with water and make popsicles for summertime! I love your verrines and anything with prosecco; it's hugley popular here in Germany. A beautiful dessert and such an interesting post; I love the way I always learn something here. St Germaine is a delicious liquor and I bet it is amazing in this dessert. All Hail Desserts with Booze in Them!! Woo-Hoo. You're the best, Barbara. I love cemeteries too. I bet there are many beautiful cemeteries in Louisiana. I've never eaten elderflower before. I have a couple of lovely recipes using it as the shining ingredient. 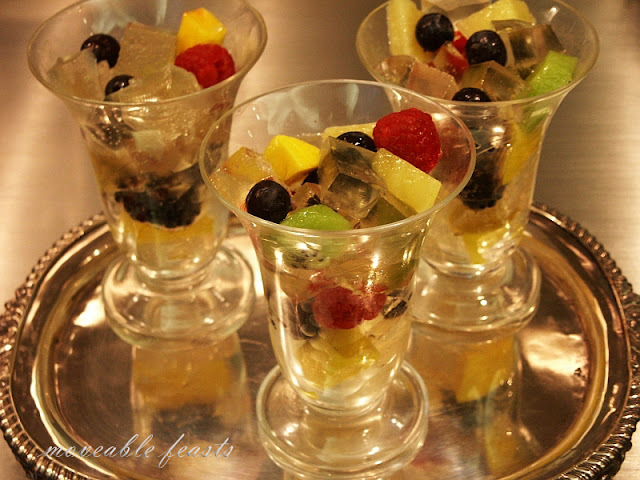 Your fruit gelee cups are gorgeous! What an interesting and beautiful presentation! Nice work, I enjoyed the post. I eat meat, girl-it has to be small farmed and organically raised though. So I suppose I am 'stickler' of sorts. It doesn't look casual to me at all. It looks very elegant! Barbara, I love elderflowers. One of our neighbors picks the flowers and puts them in some water and makes a light summer drink with them. What an amazing flavor! I'd never thought of making jelly with them, though. Great idea! The recipe sounds and looks great, I have tasted both prosecco and elderflower liquer but never mixed the two! The old postcards of French farmers had me chuckling, they look so familiar. Wow, I've never heard of elderflower before -great to know! I love the flavor of elderflower. I had a drink with it many years ago and have never forgotten it. I always wondered what to do with it in the pastry realm and now I see you have an enticing answer. Thanks for sharing such a wonderful idea. This is so pretty and so perfect for summer! The elderflower liqueur sounds fantastic in this. Sounds like a must try! I adore elderflower honey! I can just imagine the liqueur. I will be making this Barbara. it could be considered as an award. What a refreshing & well flavoured grown up dessert & with lovely fruits too! Excellent & brilliant at the same time! I wish I drank because of the pretty bottles and desserts that look so gorgeous like this one. Thanks for the bit o' education, Barbara. Always fun reading your posts! Such gorgeous gelees these are. I definitely want to try the elderflower liquer, it sounds divine. I love to eat moscato "jelly" which has a little fizz in it too. Perfect grown-up summer treats.